What in the world is going on? It’s the week before Easter, usually a time of bunnies and egg hunts on the lawn and lolling on the deck with a chilled glass of Pinot. But no, Little Ones. 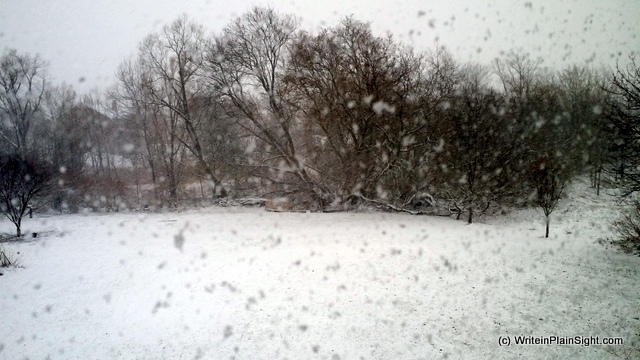 November has returned and southern Ontario is being blasted by slashing gusts of snow. AS the sun sets, if you don’t look down, the sky is a crisp pale blue. Of course I had my car at the garage yesterday to swap out my snow tires for the all season ones for summer. This is what it looked like this morning before I left for work. Dripping ice rivulets on the window, blobs of white building up on the lawn, the trees stark against the bleak sky. T. S. Eliot called April “the cruelest month”. On a day like today, I know that he was right. In King Lear, Shakespeare said, “blow wind and crack your cheeks”. Oh, yes. All I can say is, yuck. And I didn’t even resort to having wine with dinner.